Myths are the bedrock of folklore and they enshrine the people's history. In Scotland; myths, legends, stories, folktales and yarns have immortalised the nations diverse supernatural beliefs and otherworldly cultural traditions. Although the detailing changes from one place to the next, reflecting local themes and locations, Scottish myths are an oral reference library of ancient geographical, astronomical and cosmological information from a time, just after time began. Unlike Greek mythology Scottish myths do not glorify its goddesses, greatly because they were not written to serve an elitist society. In Scotland, myths evolved organically over thousands of years and were forged by people's raw experience of nature. Passed down orally, the events and activities associated to the gods, goddesses, fairies, spirits and demons record the seasonal changes and weather patterns which either enhanced or marred agricultural success. At a time when sciences were not available to explain unpredictable natural phenomenon, supernatural forces and malevolent energies offered rational answers for unexplainable occurrences. Gods, goddesses, spirits, fairies and demons were living-breathing entities affecting day to day life and because Scottish people were highly superstitious they acted out a wide range of personal, family and community wide rituals and ceremonies to assure balanced living and to enhance their chances of survival in raw outdoor environments. The Cailleach: Winter Witch Goddess. fearsome to look upon, with a dark blue, dull complexion, teeth as red as rust with only one eye which…was keen and sharp as ice and as swift as the mackerel of the ocean. Her hair was long and white and her clothing was dark grey except for plaid 'a dun coloured shawl that she wore tightly wrapped around her shoulders'. This dark, witchy attire, has become iconic for those who belong to or are associated with hidden/other worlds. She was the supreme being, the mother of all gods and goddesses and with her magical staff and tamed wolf, she was powerful, feared and respected. Affectionately known as ‘Grandmother of the Clanns’ and ‘the Ancestress of the Caledonii Tribe’ , legends speak of the 'Bringer of the Ice Mountains, the 'great blue Old Woman of the highlands'. Also called Gentle Annie, Gentle Annis, Black Annis, Scotia, Carline and Mag-Moullach, she was the beloved mountain giantess who protected the early tribes from harm and nurtured them in the shadow of her sacred mountain. Cailleach’s famous white rod, or slachdan, made of birch, bramble, willow or broom, is akin to a Druidic rod which gave masters of the old religion power over the weather and the elements. Cailleach was a goddess who governed dreams and inner realities and as such she was the guardian of the sacred hill, the Sidhe, and the place where we enter into the hidden realm of the Fey and spirit beings. The Aos-sídhe, Sìdhichean, or 'Fairies' were the pre-Christian divinities of Gaelic Scotland. The Cailleach is connected to the ‘bean sidhe’ or banshee (supernatural woman) - the wild women of the otherworld - Fey. Neolithic standing stones were regarded as sacred, the bones of the earth, and were her special haunts. Traces of her name can still be found in Ireland, Scotland and in England in the names of ancient places where natural energies were most abundant: towering costal cliffs, rolling hills, deep glens and river gorges, still forest ponds and tumbling burns. 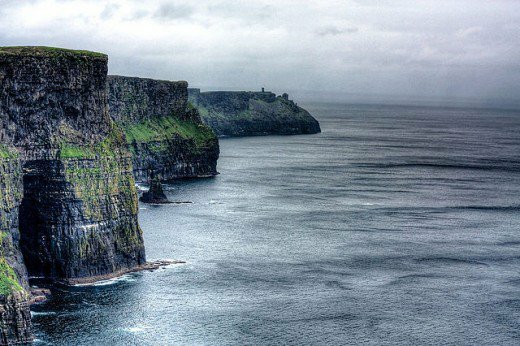 The Cliffs of Moher in County Clare, Ireland are also known as Ceann Cailli, named after the witch goddess Cailleach. She was an authoritative supernatural wilderness figure, a wise old grandmother with magically enhanced fertility powers. She was considered to be a great healer and was associated with successful childbirth. But sadly, even with her 'long ancestry and incredible longevity' the advent of Christianity saw her demonised, actively scrubbed from Scottish culture and cast down to the role of a nun. In The Book of the Cailleach: Stories of the Wise-woman Healer, writer Gearóid Ó Crualaoich summarises the multiplicity of cultural significance assigned to this ancient figure. Cailleach Bhearra… appears as a representative figure of the Divine Hag in Celtic and early Irish worlds who has close connections with the sovereignty queen tradition. Cailleach Bhearra can also be seen as a version of a supernatural female wilderness figure, peripheral to and usually inimical to the human world. In modern Gaelic folklore of Scotland she is most frequently understood as one of a range of such wilderness figures and it can be asserted that these owe their existence (at least in part), in Gaelic traditions, late and early, to the influence of Norse cosmology in its personification of the forces of wild nature." Beira was 'at once creator and destroyer, gentle and fierce, mother and nurturer'. She was unique in several ways compared to other female creator goddesses, for example, most others represent the universal concepts of duality and polarity which people experienced in the creating and destructive powers of nature, which they used to form their world views and greater cosmological speculations. But Beira was the controller of 'our inner worlds' the manipulator of fate, moods, foresight, premonitions and dreams. She was more than the holder or balancer of polarity and duality, she was the essential energy upon which both of these concepts stood. She was the archetypal witch, the maker and destroyer of worlds who came from another dimension, having stirred the cosmic soup of creation in her universal cauldron. Many parallels can be drawn between the structures of Scottish creation myths and those found in Pre-Colombian South American Andean cultures. In both, prominent natural features were thought of as being alive and flowing with powerful female and male forces. It was female power/energy that was associated to both the event of creation and to controlling lunar and solar cycles - which in turn dictated all ritual, agricultural and civic calendars and ceremonies. They differ in that Andean cultures invariably associated the highest snow capped mountains and gushing rivers with gods, emanating powerful male energy. Rounded hills and flowing rivers were considered the generators of female energy and the dwelling places of goddesses. Contrary to this Andean sacred geographic format, in Scottish myths Beira unashamedly inhabits the highest mountains and takes on the gender roles more commonly attributed to male gods. She got involved not only in farming and matters of fertilisation, but also in wars and politics. Most creation myths offer data pertaining to key agricultural, ritual and civic dates in ancient calendars. These dates can be derived from the mythical activities of the creator gods and goddesses, the number of times an activity is repeated, and from the times at which the activities occurred. The oral myths of the Cailleach are a rich astronomical guide to how ancient Scottish people interacted with the sun's annual cycle and how it affected agriculture. 2. In partnership with the goddess Brìghde, the Cailleach was a seasonal deity who ruled the winter months between Samhainn (1st November) the first day of winter and Bealltainn (1st May) the first day of summer. 3. At Samhain (winter) the Cailleach could be seen riding through the sky on the back of a wolf. This corresponds to the old Gaelic name for the month of January being Faoilleach or 'wolf month'. 4. Her reign as Queen of Winter ended on the June solstice, the longest night, at which time she visited the Well of Youth and then grew younger day by day, until the shortest night on the December solstice. 5. Many tales say the Cailleach had two faces. On the June solstice she turned into a beautiful young woman - Bride - once a goddess and now a Scottish saint, still celebrated on February 1st marking the return of the light. 6. At winter’s end the Cailleach 'turned into a grey boulder until the warm days were over'. The boulder was said to be 'always moist' because it contained life substance. A great example of a mythical concept manifesting in the psyche of people, then being brought into reality and being acted out in a ritual, is found in every part of Scotland. where seeds were planted. At harvest time the first farmer to finish made a corn dolly known as a Countryman's Favour, representing the Cailleach, from the last sheaf of his crop. He then threw the dolly into a farmers field who had not yet finished bringing in their grain. The last farmer to finish had the responsibility of looking after the corn dolly for the duration of the next year, with the implication they'd have to feed and house the unpredictable hag all winter, enduring her mischievous manipulation of physical objects and events. Competition among farmers was fierce to avoid having to take in the wicked old woman. This is a great example of how a myth made sure harvests were addressed with gusto, and therefore a mythical concept directly altered reality, enhancing local economics, food stocks and it directly aided and enhanced community survival. Ancient Scottish astronomical lore is encapsulated in what is perhaps the best known tale dealing with the legend of the Cailleach. In 20th-century folklorist Donald Alexander Mackenzie’s ‘The Coming of Angus and Bride ’ the Cailleach holds Brìde captive because her son Angus is in love with the maiden and she is jealous of her beauty. The Cailleach orders Brìde to wash a cloak until it is white and Brìde laboriously did so, day after day, without making any progress. Father Winter helps her clean it and overjoyed, Brìde returns to the Cailleach with the white cloak and some snowdrops, which enraged the Cailleach (evidence of her power waning) so she went out with her magic hammer and caused frosts and storms all over the land. John Duncan The Coming of Bride, painted in 1917. Meanwhile, Angus dreamed of the beautiful Brìde and eventually set out to rescue her. To do so, he had to 'borrow three days from August' (calm, warm weather) to ensure a safe passage to where Brìde was being held captive. Angus finally married his love safely in the Fairy Kingdom on the first day of spring – Brìde’s Day. The Cailleach was outraged and after sending her eight hags to wage war on Angus she borrowed 'three days from winter', to assist her battle against the forces of spring, and Angus's was attacked once again by the cold forces of winter; driving winds, deep snow, hard ice, and cutting frost. On that day which is of equal length with the night, Angus came to Scotland with Bride, and they were hailed as king and queen of the unseen beings. They rode from south to north in the morning and forenoon, and from north to south in the afternoon and evening. A gentle wind went with them, blowing towards the north from dawn till midday, and towards the south from midday till sunset. It was on that day that Bride dipped her fair white hands in the high rivers and lochs which still retained ice. When she did so, the Ice Hag fell into a deep sleep from which she could not awake until summer and autumn were over and past. Early on Yule E’en...he was joined by the other members of the household, now relieved of toil, and they returned with the Cailleach in their midst. The stump was placed ceremoniously in the heart of the peat fire, and the whole company cracked jokes while the Christmas Old Wife blazed. McNeill, vol 3, p72-73. At Bealltainn bonfires, in some parts of the Highlands, a cake called a 'bonnach bealltainn' was distributed among the men by the ‘master of the feast’. Part of a bannock was marked with a symbol of the Cailleach and whoever got this piece was known as ‘cailleach beal-tine’. The unlucky person was stuck with it for the duration of the next year. You will have noticed that this ritual is another version of the farmer's straw dolly ritual. In Scotland, the Cailleach was a supernatural wilderness figure with several functions: she controlled the weather, especially storms; had strong connections with water, including guarding wells and forming rivers and lochs; she heralded winter and created mountains and landscape features. In some parts of Scotland myths say the hills and mountains were formed when she accidentally dropped rocks/peats from her basket/creel and in other cases she is said to have built the mountains intentionally, to serve as her stepping stones, and that she crafted the mountains, rivers and lochs with her magic hammer. A sacred dynamic repeated in every legend and myth of the Cailleach is that she carried a magic staff which 'froze the ground with each tap'. At the end of each winter she threw her staff under a holly and gorse bush which believed to be her sacred trees. Then, the goddess transformed into a grey stone to signal that winter had ended. In creation myths around the world, creator gods and goddesses are described carrying staffs which controlled the weather, for example, creator god Virachoca used his staff to establish the Inca civilisation in Peru and Bochica tapped his staff to create the Tequendama Falls in Colombia. Staffs being driven into the ground by creator gods represented mastery over the celestial cycles, understanding of astronomical observation, the establishment of calendars and the achievement of geometrical thinking. Where staffs appear in creation myths, more often than not, important locations once deemed sacred within ancient landscapes can be found. Holes made by the staff of the 'divine hag' have been found on many geographic features around Scotland. I have prepared this list of eleven locations associated to Biera that you might want to build into your next trip around Scotland. Britain's highest mountain Ben Nevis was Beira’s ‘mountain throne’. This sacred mountain marked an ancient prime meridian which is dotted with sites of astronomical significance. A line drawn directly south from the summit of Ben Nevis passes between England's two highest summits, Scarfell Pike and Scarfel. The stone ruins of her palace are to be found in Tiree in 'Loch-a-phuil' – Mud-lake – and bear the name of 'Totacha Cailleach a Bheur' – Old Wife Bheur’s Roofless Walls. A creation myth concerning this loch tells that the Cailleach forgot to replace the capstone of her well and it overflowed and created the loch. A similar story explains the creation of Loch Awe near Oban. Beira was also said to have transformed a troublesome maid, Nessa, into a river which eventually escaped and formed Loch Ness. Also, Bogha na Cailleach – bogha, a rock beneath the tide – is the most dangerous rock on the Inverness-shire island coast. Mount Schiehallion ‘Fairy Hill of the Caledonians’ is a prominent mountain located in Perth and Kinross and is described as the geographical and spiritual centre of Scotland. On the rugged side of Shiehallion there is Sgrìob na Caillich – the Old Wife’s Furrow – where she unearthed huge masses of loose stones while ploughing. She ushers in winter by washing her clothes in the Corrievreckan (Coire Bhreacain, the speckled cauldron), a great whirlpool between Jura and Scarba and the sound of this whirlpool is said to be like 'the roaring of a thousand chariots'. In Celtic folklore it was Cailleach Bheare who formed and shaped the islands of the Inner Hebrides by dropping a creel of peat and rocks into the sea that she had brought with her out of the North. Many mountains and lakes in Scotland are also said to owe their existence to her. She is therefore one of the Earth Shapers, an ancient Celtic deity who seems ageless. There are three hills above the Strath of Appin whence 'rhymes were shouted' in commemoration of the defeat of 'Latha na Caillich'. They are; the peak of Portnacrois hill; Ben Donn, above Glenstockdale; and a high peak to the east looking down on Glean-na-h-Oighle. Beinn na Caillich on the Isle of Skye is another one of her winter haunts, as are other mountains prominent in the surrounding landscape. She is said to generate fierce storms of sleet and rain, wreaking havoc and destruction upon the lands below. Beira was exhausted and slept by the side of a well on Ben Cruachan and forgot to cover it up. The water continued to flow throughout the night and broke through the Pass of Brander and created Loch Awe. Many people and animals were drowned by the changing waters and when Beira finally woke up she was horrified by what she had let happen and turned to stone. Creag-na-Cailleach - ‘Old Wife’s Rock’ - is where the Cailleach rests in stone, looking over the Pass of Brander after she let the waters of a well flood the valley below. Glen Cailleach, beside Glen Lyon in Perthshire, has a stream named Alt nan Cailleach and this area is famous for a pagan ritual associated to the Cailleach which is still carried out to this day. Also, Tigh na Cailleach is a small turf-roofed house hidden away in a remote glen west of Glen Lyon in Scotland. The name of a mountain near Loch Leven, Beinn a’ Bheithir, translates to ‘hill of the thunderbolt’, and is said to be named after the Cailleach Bheithir. On the summer solstice, from the top of Beinn a’ Bheithir, the sun is seen rising from behind Ben Nevis, Beira's Seat, to the north east. This powerful 'wise women healer' from the oral traditions of rural communities is embedded in the texture of Scotland's culture. Collected and retold for many decades, myths about the hag, the dark goddess, the Cailleach, are part of an oral tradition which has its roots in pre-Christian Scotland and when explored they reveal a complex understanding of nature, the earth, of human psychology and its interaction with natural features and occurrences.